Does anyone remember Skitch? 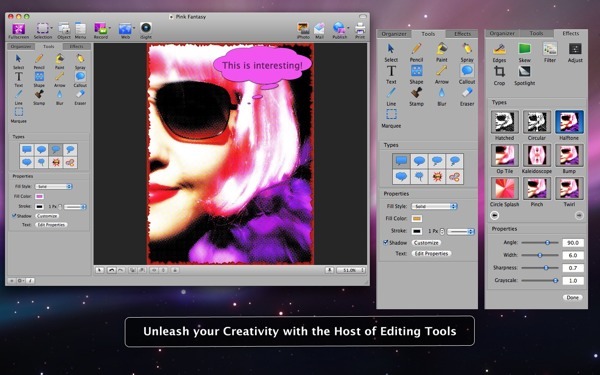 Developed by Plasq, it was a light, simple app that allowed you to quickly take screenshots on the Mac and then annotate them easily with text, callouts and graphics. Skitch was acquired by Evernote a couple of years ago, and as it has become more deeply integrated with their platform it has refocussed on document annotation and as such has lost a lot of its charm. 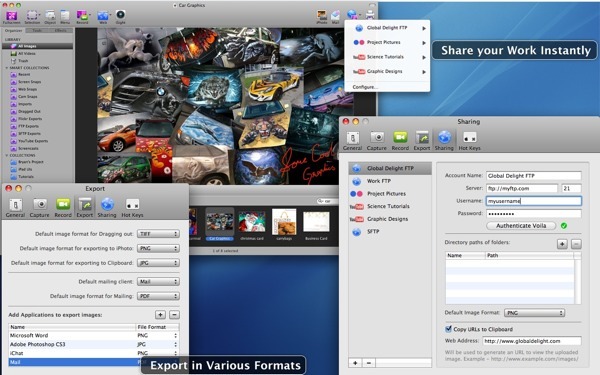 However, Voila from Global Delight boldly takes up that mantle and aims to deliver a complete toolset for any Mac user needing to work with screen captures. Any utility that does screen capture has a tough time on the Mac nowadays, as OSX already has the basics covered in a variety of ways. For a start, images are recognised as discreet objects and can be dragged and dropped between apps. There is the discreet (and pretty full featured) Grab app in the Utilities folder on OSX, and the Preview app has a screen grab menu item. There are also keyboard shortcuts available at any time that drop full screen grabs into your Pictures folder. All of this gives a dedicated, chargeable app a bit of a functionality hill to climb. However, Voila has this extremely well covered, with pretty much every capture mode I could think of represented. Fullscreen or selection capture is offered (with a variety of selection shapes and a freehand mode), as well as screen objects and menus. If you are interested in creating screencast-style movies, you can capture quicktime movies of either the full screen or a selection, with computer audio, voiceover and mouse click support. Web pages can be caught using the system’s browser, or you can use the app’s inbuilt browser that allows for marquee selection or highlighting of the various page HTML constituent components. Finally, your iSight camera can be used as a capture source. At this point, you might think that Voila has justified its existence with this wide variety of options, but Global Delight are only getting started. 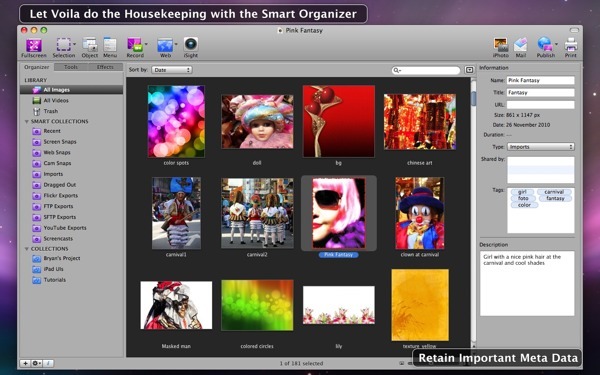 There is a full organiser that works broadly the same as iPhoto does; collections and smart collections (based on image metadata) can be used, and keyword tagging can also be applied. 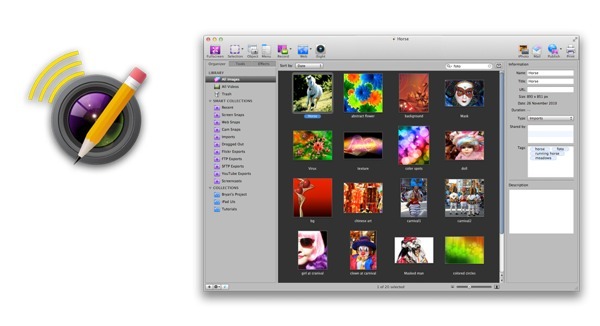 Image editing is also fully supported; many of the basic facilities you’ll find in Photoshop or Pixelmator are provided, with a slant towards annotation and highlighting. There are a number of stamps and callouts, shapes and line tools, and everything remains fully editable and layerable (with an extensive edit history) unless you flatten your screen capture for export. There is also a set of filters and screen effects, as well as the traditional adjustment sliders. Export is perhaps the one area where Voila is slightly lacking. Images can be printed, sent to iPhoto or passed to an email, or you can configure FTP, Secure FTP, Flickr and Youtube accounts. You can also configure applications as export destinations (though the destination program must be able to recognise incoming picture formats). However, for some reason there is no toolbar icon for direct saving of images to disk (though there are menu commands to do this), and also no API support for sharing services such as Dropbox, Google Drive or even Apple’s iCloud. So functionality is rich, but this does not matter unless the app is easy to use and performs well. I had no performance issues on my test machines (recent MacBook Air or Mac Mini computers), and the interface is clear and self-explanatory, with good use of tabs, buttons and tooltips. The appeal of an app like this really depends on your needs. If you only need to capture screen images occasionally, then you can probably get by with the built in OSX tools. However, if you need to build a workflow around still or moving screen capture, I don’t believe you’ll do much better than Voila, especially at the good value asking price. I do remember Skitch and use the iOS version every day or so to annotate screenshots as part of our user support for our iOS apps, its still very useful at what it does. Agreed, Skitch is great on iOS. 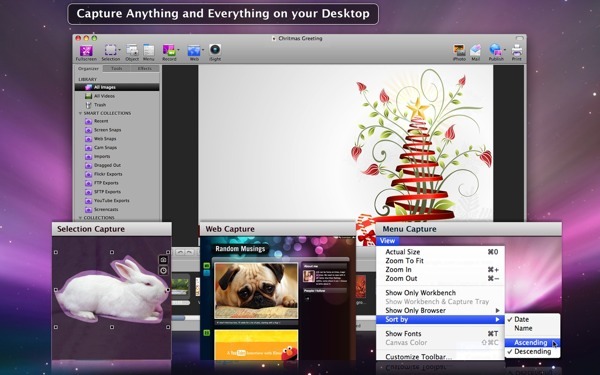 It is, however, refocussed on the Mac into an Evernote capture engine.